Here you will find a few of our Sock Monkey Friends! Some make Sock Monkeys and some paint Sock Monkeys...but all create Sock Monkey Fun! The place to go for knitting patterns. Sock Monkeys are only part of the story. Tamara has dedicated her life to international bible education and she often finds herself in far off countries doing just that. Yet regardless of where she is, she spreads her enjoyment of knitting, crocheting and making Sock Monkeys to those around her. Her knitting seminars are usually attended by 10-20 people and her "Sock Monkey School" is world famous. SockMonkeyFun.com came about as a way to display Tamara's Sock Monkeys. Yet when the orders started to pour in, an idea of sharing was struck upon. She could create quality, one of a kind Sock Monkeys and others would pay for the supplies. Genius! 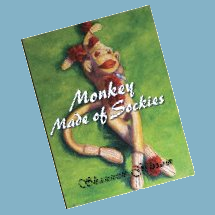 There is no telling where in the world she will be next month or next year but you can count on her teaching Sock Monkey makin, collecting yarn' and looking for new design ideas for Sock Monkey Fun! The Future of Sock Monkeys! 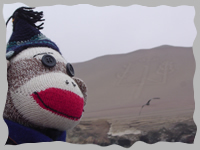 Ceru Monkey has taken on the challenge of collecting free patterns, websites and links to all things Sock Monkey. Visit SockMonkey.net to get your Sock Monkey On! One bad thing about being married to a web developer is that unsuspecting to you, anything can be put on the internet about you.